Is Winning Everything? – Part 7 – SUCCESS! I started this series several years ago and have never written this last installment. When I saw that the next Dog Agility Blog Event would be on SUCCESS, I knew that it was time to finish. I hope you enjoy this and the other blogs on success! I once was told that if you wanted to be “someone” in the agility world you needed to win something. To me…”being someone” was to be successful! Winning something was not your weekly local trial, but you had to really WIN something. Something like Nationals, make it on the World Team, something BIG. It’s not that I wanted to be “someone” as much as I really enjoyed teaching and presenting seminars. How could I be a successful teacher when I haven’t WON something? How I twisted that…one will never know! When I find something I enjoy, I throw myself into it all the way. I LOVE teaching, it’s what I do. Whether it’s dogs and agility or kids and the violin, I just LOVE teaching. Bria was my first Border Collie and she was the one that really made me realize the fun of the game. I had done “stuff” with Noodle, my English Springer Spaniel and first agility dog. We went to AKC Nationals 4 times and the Invitational twice. Granted we didn’t WIN, but we had a great showing and in my mind we were successful. 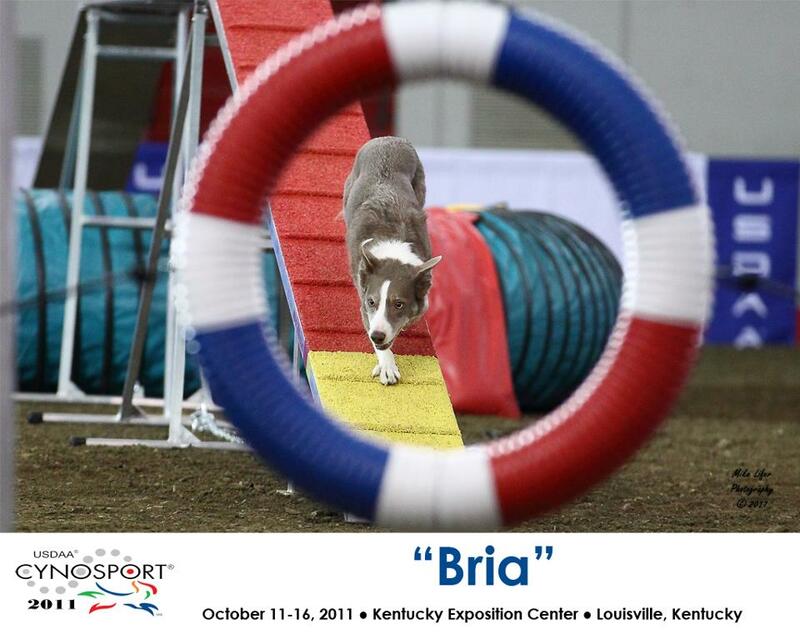 The first time I took Bria to AKC Nationals was in 2009. We made it to Finals and went off course. It happens, but I was so happy we made it that far. It was shortly after that, when I was told you need to WIN something. Who wants to hire someone to teach if they lose. Getting to finals is great, but you need to WIN. I replayed that run over and over in my mind for months. Woulda , Shoulda, Coulda…but I didn’t and I didn’t WIN. That year, I also entered World Team Tryouts. Going into it I knew that I had a good chance of not measuring in. For those that don’t know…to jump 18” at the World Championships, the dog needs to be 16 7/8inches or less at the withers. Well Miss Bria can measure anywhere from 16.5 to over 18 inches. Long story short, we have yet to consistently get a measurement anyone would comfortable replicating in Europe if we were to make the team. I had convinced myself that I would be ok with it if she didn’t measure in…but WAS I ok with it? On the outside yes, on the inside looking back on it…no. One of my all time favorite photos and it just happens to be from that Quarterfinal GP run! The turning point in our agility career was at the 2011 Cynosports. I was running quarterfinals of Grand Prix and little Miss Bria, who rarely makes a mistake, missed a weave pole entrance. The FIRST thing that went through my head was now I can’t WIN anything. It went through my head before I even got her back in those poles. I left the ring, trying to hold my head high and telling her she was a good girl, but she knew something was wrong. The dog ALWAYS knows. I went back to my RV and just broke down. I had my pity party for about 20 minutes and then I said…this is stupid…I’m crying over a weave pole entrance and this is just a game I’m playing with my dog. My dog who absolutely loves the game and could careless if we WIN anything. Those moments in the RV, hugging my dog and crying was the beginning of OUR success! After that event I took sometime off, I didn’t show much, didn’t do much teaching, just had some fun time with my dogs. It took me a good couple of years to get that “you have to WIN something” conversation out of my head. Now the person that said that to me, may or may not have wanted to have the impact it did on me. I have slowly started showing and teaching more and more, but still take good chunks of the year off. I’m excited to start my 4-H agility group tomorrow night…17 youngsters eager to learn the game of agility!! Agility is supposed to be a fun game that we play with our dogs, our dogs do this for us. They don’t care if they go to a show or just play in the back yard. As soon the game isn’t fun anymore, it’s time to take a step back and reflect on why we play the game. Soon after that famous day in Kentucky, I started a new “routine” with my girls. Before EVERY run…I bend over, pet them, say LOVA YA and then we’re ready to play the game. Success…it’s not about winning, it’s about enjoying the time we spend with out best 4-legged teammate on or off the course!